Lots of great plancha hotplate recipes in my cuisine a la plancha section. "Beaucoup des recettes plancha!"... I try to help my friends in the South West of France where plancha cooking is extremely popular. For a rough translation think about an outdoor tabletop gas grill. Sadly all my recipes are in English but I hope that doesn't stop anyone from having a go and enjoying the great flavours on offer. Cuisine a la plancha is also a common method of preparing food in Spain (especially fish and seafood) and I've got into it since getting my Monolith cast iron plancha for my ceramic grill, it's a really great way of social alfresco dining. Many of the recipes below can be done on a traditional grill as well but I think that these lend themselves very nicely to the hotplate grill. The distinguishing feature of the plancha or hotplate grill is that the food is in direct contact with the heat source and this allows for food to cooked at high temperature upon immediate contact with heat. In essence, recipes that require a blast of high heat are ideal for the plancha. Cooking slower is also possible on the plancha however the benefit here is not so much in the cooking process but economy. Again it is by virtue of the fact that the food is in direct contact with the heat source, this makes hotplate plancha cooking comparatively economic. 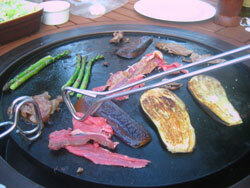 Hotplate grills - The whole grill is a hot plate. 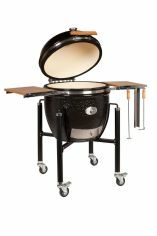 Either powered by electric or gas, these grills are extremely popular in Australia and also for commercial cooking. The benefit of this type of grill is that heat is instant and cleaning is really easy. Plancha accessories - these are extras that you can use to cook on your existing grill. This route gives you all the benefits of cooking on a plancha and still have the option to cook with smoke. All of the information below is relevant no matter which way you choose to go. Ensure that the plancha is made from thick metal. Dependent on the grill I'm using I have both stainless steel and cast iron planchas. The stainless ones tend to be simply a flat plate and work well over a gas burner, in fact if considering buying a complete plancha grill then stainless steel is definitely the way to go for easy clean. Accessory planchas are made of cast iron and have the flexibility of being reversible. One side has a flat surface and the other side is ribbed. 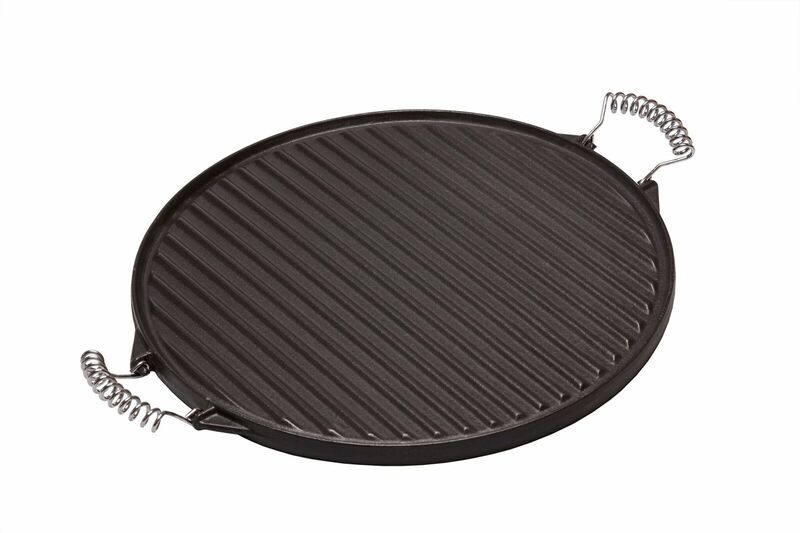 This gives you the greatest cooking flexibility and the ribbed side gives wonderful sear marks to sliced veggies. Make sure that your plancha has a lip to the edge because this stops oils and juices dripping off the plancha and onto the coals. 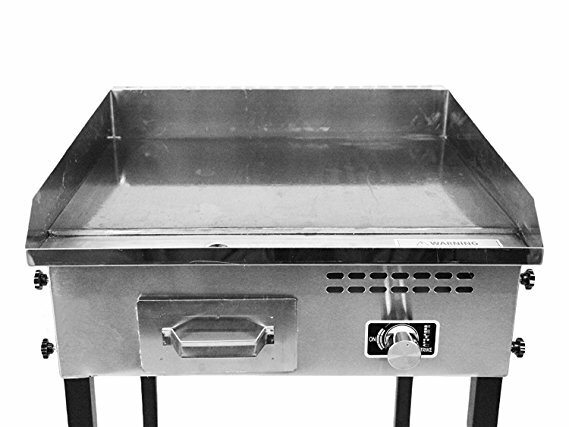 For commercial cuisine a la plancha (or just cooking large quantities) then a plancha with a drip hole and removable waste container is helpful. 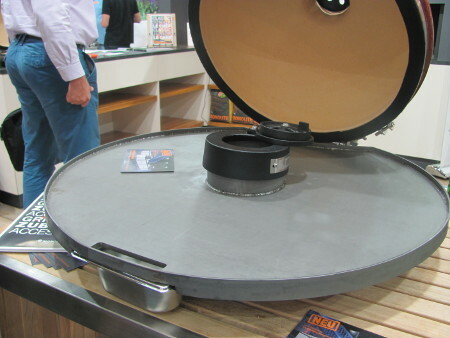 Here's one made specially for a kamado ceramic grill. The first thing to do when you receive your new plancha is to wash with warm soapy water before using and dry well. This will remove any dirt or factory residual grease. Next you need to season your plancha by wiping both surfaces with a good amount of vegetable oil and then bake it indirectly in your grill for about an hour at 150°C (300°F). Wipe clean when it has cooled and then you're ready to cook. When you've finished cooking, place it directly over the coals and get it super hot. Now carefully pour on a cup of water taking care not to scorch yourself on the steam. Finally scrub with a grill brush as the water bubbles until your plancha is free of debris. When clean (and cool) oil the plancha surfaces with vegetable oil and store in a dry place until next needed. The list will get bigger in the fullness of time and I hope that you enjoy cooking them and much as I've enjoyed developing them. Mini Lamb Koftas With Yoghurt Raita Dip - an easy appetiser. Coriander Marinade For Grilled Tuna - dip in the marinade and flash sear on the plancha.